iKON breaks 100 hourly Perfect All Kills for Love Scenario! Jinhwan is Perfectly Stunning at the 2018 GAON Chart Awards! iKON TV is Really Coming! On the 29th March, 2018, Korean and International iKONICs mysteriously trended the hashtag #Puzutgan1stWin leaving non-fans and even many fans that were not in the know a little baffled. Here is the amusing story behind it. On that date iKON had an unusual schedule. As a part of the events being shot for their first and highly anticipated solo reality show, iKONTV, they appeared on Korea’s popular Lotte Home Shopping Network! There, in a “Mukbang” style broadcast the boys took on the challenge of selling extremely luxurious and high end Beef and Pork from YG’s 3Geori Butchers.The boys displayed their beagle charms, a little aegyo and ate very well indeed! Their charm must have carried over well because before the show was over the expensive meat was all SOLD OUT! The boys did a victory dance to celebrate and for a while it was a little chaotic! iKONICs were reminded once again of one of the very many things we love about our boys. Shortly after the hashtag #Puzutgan1stWin started floating around and it’s unclear wether it started with Korean or International iKONICs but soon the fandom was united in celebrating the meat sell out with this hashtag. Why? Apparently “Puzutgan” is the romanisation of the Hangul name for 3Geori Butchers. iKONICs just decided to celebrate selling out the meat like a music show win! A fun loving group and their fun loving fandom indeed! Here is Top Star News’ coverage of the event. iKON has been shooting events over the last couple of days in connection with iKONTV with a speculated theme of “Part Timers”. So far they have appeared on the streets of Seoul, Campus Grounds, Aori Ramen and a Day Care Centre. Let’s keep looking forward to iKONTV which is sure to be very interesting! March 28th 2018 – A few days ago iKON was picked along with hip hop artists Okasian and Bryan Chase to perform at the Kenzo After Party and from all indications it was another lit iKON stage! The French/Japanese Luxury Design house Kenzo recently opened a flag ship store in Seoul on time for Seoul Fashion Week and the after party “Kenzo loves Seoul” which was held on a party boat was to celebrate the event. Opening party of the new @kenzo store in Seoul with creative directors Humberto Leon Carol Lim and djs #discosmack. Celebrities in attendance included Seo Kangjoon, Wondergirls’ Ahn Hee and BoA. [#HQ] 28.03.18 | Kangjoon no evento da KENZO. Wonder Girls former member Ahn Hee, attended the KENZO photo event. Flagship store in Seoul · Cheongdam-dong. iKON performed their mega hit song Love Scenario and the celebrity crowd sang along! They also performed Rubber Band and Bling Bling to loud cheers. iKON performing Bling Bling at Kenzo Seoul Party. The boys represented Kenzo in floral outfits from the most recent collection. Best of all they made new fans! Let’s hope for more fiery iKON stages soon! Over the last weekend iKON once again thrilled an Arena full of fans with a setlist of old favorites and some new Christmas performances during their two day iKON Xmas Live Concert. If you are a fan of iKON you probably know what a treat their live performances are. The boys have perfected having contagious fun with engaging interludes on stage and their sheer kinetic energy is something that fan accounts have said is one of a kind and a must to experience. A new live performance is always cause for excitement and fans who looked forward to the Christmas Show were not disappointed. The special element of this Show was no doubt the wholly Vocal Line Stages which were the first of their kind for iKON Concerts. On a beautiful 360 degree Centre stage that lit up, lifted and dipped along to the music, iKON performed many of their original hits with a fresh feeling that made one realize why they are favorites. Bobby was also able to perform a solo stage of “Swim”, a track from his debut album. The big surprise was when he performed another track, “Secret” along with fellow iKON member Donghyuk and KPop Star 4 winner and label mate trainee Katie Kim! Many Japanese News Portals covered the Show and were full of praise for iKON’s continued and consistent Showmanship. iKON reportedly drew an audience of 30000 over the two days of their Concert to the venue that not long ago hosted the Mnet Asian Music Awards (MAMA) – a feat to be proud of for a merely two year old Korean group! YGE has announced that iKON whose first Variety Show, JTBC’s iKON Picnic aka Idol School Trip just aired its final episode, will be coming back with an album in January 2018. We all certainly hope so. iKON’s Kim Bobby thrilled fans with the first live performances of tracks from his hotly anticipated debut album, Love and Fall as part of promotions for the album’s Japan release. Though the album was originally released in South Korea on September 14th 2017 it took till November 29th for fans to be able to see more than a single promotional stage for the album’s title tracks due to YGE choosing to skip a promotional cycle for the album which was released while iKON was still actually on an extended Dome Tour in Japan. Bobby’s live performance of tracks from Love and Fall were broadcasted on the popular Japanese video site/web channel Nico Nico. The live included interactions with an MC during which Bobby answered questions about the album, played games, thanked fans for coming and mysteriously asked them to anticipate iKON’s next activity. Bobby’s stage itself was very simple featuring just the artist and a mic yet the atmosphere was full of Bobby’s excitement for a live performance and the intensity of his passion for music. 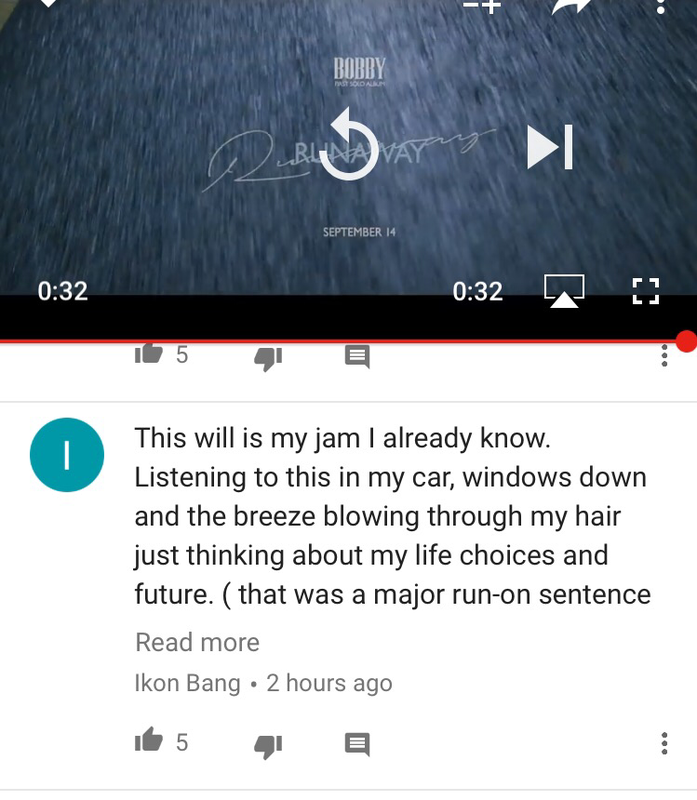 Love and Fall was a surprising album for even the oldest and staunchest Bobby fans/iKONICs not just because after 3 years of waiting people had given up hope it would ever be released – but because the idol who was most famous as the young power rapper who won SMTM3 took a risk and did what no one expected by releasing a personal and heartfelt and mostly vocalist album! Bobby sang his heart out and touched fans with the beauty and sincerity of his lyrics and the heart they revealed. This made getting to see him perform tracks from this album even more special for fans and Bobby did not disappoint with his electric performance. See below for the entire Nico Nico Live stage. Bobby also performed tracks from his album today at the Nike Force Battle Event marking the first time some of these tracks have been performed live in South Korea! It’s truly good time to be a Love and Fall fan. 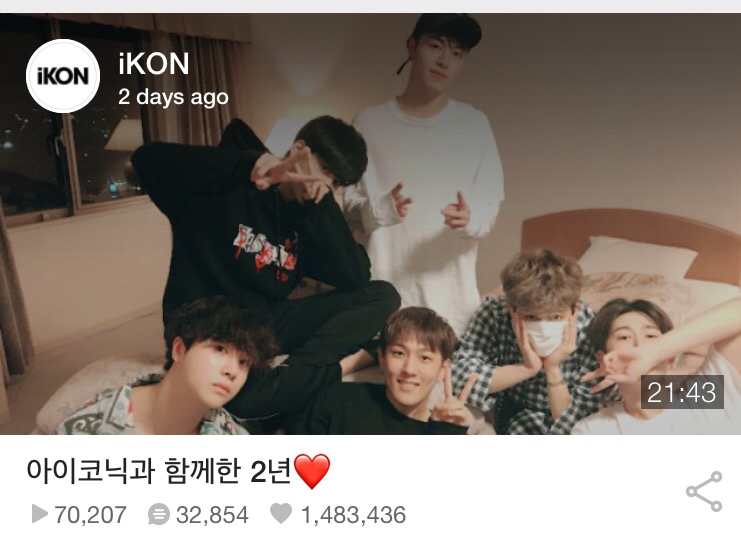 On Sept 15th, iKON celebrated their 2nd Anniversary by warmly meeting with fans via V Live. Despite having flown into Japan that day followed by a long bus ride to Nagano, the venue for the Concert scheduled for the next day, the boys made a concerted and much appreciated effort to appear before fans on their special day. The boys couldn’t quite disguise their travel fatigue and Bobby who just released his solo debut album the day before was still en route to Japan and so wasn’t present. Despite it all the boys showed a cheerful spirit and teased each other a lot. This is iKON’s style and their great charm. – Congratulating Bobby on his album, and Donghyuk singing an excerpt from ‘Secret’. – Hanbin’s favorite song in Bobby’s album is “Swim” but when iKON sang it it turned into a song about Yunhyeong’s beard? They rounded up their VApp so they could have an even more intimate one with fans on their Plus Channel. You can watch this 2nd Anniversary broadcast on their regular channel with Eng subs now. iKON held two Concerts in Nagano yesterday and are scheduled to hold 3 fan meetings in Osaka tomorrow. We wish the boys love, good health, success and prosperity going forward in all their various activities. We apologise that this is late but we had a LOT of thoughts! Earlier today the Video Teaser for “Runaway,” the second title track on Kim Bobby’s first solo album “Love and Fall” was released by YGE making an emotional mess out of all of us. We knew this album was going to be an intimate look at not so much Bobby the stage eating monster rapper but at Kim Jiwon the artist behind him ~ knowing and seeing, however, are two different things. From the Teaser’s opening with a Biblical verse, essentially a cry for help that is also a reflection of Bobby’s deeply spiritual side, you realize immediately that we are getting access to a Bobby we’ve only seen glimpses of from behind the scenes. I called upon the LORD in distress: the LORD answered me, and set me in a large place. From Bobby perched high on an overpass in his adopted hometown of Fairfax, VA, a pair of sneakers dangling beside him which we later see engulfed in flames – to Bobby running in slow motion through an overlapping image of himself and cars with lighted headlights literally rain down above him – The Runaway teaser packs an emotional as well as visually stunning wallop for something that’s just 32 seconds long. Strong images of alienation, solitude and even desperation followed by the refrain of wanting to run away in Bobby’s soulful, raspy vocal accompanied by simple guitar chords leaves you with a melancholic feeling and a desire for more that is perfect for the incoming colder seasons. It had a big impact on our team and as can be imagined it has had a big impact on fans. Anyone can relate to the story of Runaway. I don’t think there is anyone who has not felt at some point overwhelmed by life’s responsibilities and wanted to get away from it all even if it’s just for a little bit. Anyone who knows Bobby’s journey from a lonely 14 yr old who came to Korea on his own to pursue his dreams and save his family from financial struggle – anyone who has watched his fights, his failures, his victories and his continuing struggle can understand why Bobby would sometimes want to run away. It’s not even his first time writing about how hopeless the quest and heavy the burden is of the path he chose. Bobby has expressed the message of #Runaway before. When he was caught between SMTM – M&M. In the end Bobby didn’t run away. He hung in there and battled and thanks to that we get to see the man he is becoming today and we will soon hear his heart. He’s going to make us all cry and I cannot wait. The ball is already officially rolling on the arrival of Love and Fall as today Bobby sat in with members of the Press for a Listening Party! YG Creative Director, Sinxity's IG Update of Bobby. Finally on D-Day lucky fans will get to join the audience for the V-Live Countdown happening with Bobby! Foreign Friends in foreign lands are not as lucky but let’s all tune in for the VApp Countdown Live on Sept 14th at 6pm KST and give Jiwon all our love! We know he deserves it! Konbats Shine Bright in the Daylight as iKON Rocks A-Nation! iKON performed live today at Japan’s Annual prestigious A-Nation Festival, the Crown Jewel of J-Pop Summer Festivals, for the 2nd time in their less than 2 year career and iKONICs proved that Konfire (the ocean of the Konbat light stick) can burn as brightly as the sun! The Concert took place at Japan’s Ajinomoto Stadium in Chofu, Tokyo, an almost 50,000 capacity venue and was well attended by happy festival fans. Japanese iKONICs came in numbers – men, women, youth and children – and after buying out three stalls worth of merchandise they coloured the stadium fire red with a passion that Yunhyeong would have been proud of! iKON’s set came up at about 5pm and many non fans were shocked at the amount of support they recieved. It was still daylight but the stadium suddenly began to blaze with Konfire and the fan chants rose! AMAZING FANCHANT. Thank you for coming to support our boys. Despite two members literally flying in from overseas schedules, iKON performed as strongly as ever and entertained with their signature wild Ad-libs and infectious energy. They were also able to communicate well with the audience in fluent Japanese during their Ments! It’s no wonder the boys even trended in Japan! iKON’s Japan schedule will kick off officially in September with the start of their New Kids Japan Tour that includes 22 Concerts. Meanwhile, their Mini Album continues to do very well, topping charts like Tower Records, Oricon and Billboard and proving iKON’s unrelenting popularity in Japan. Check the #iKONanation2017 tag to see all the fun! Posted on August 27, 2017 August 27, 2017 Author Indigo RadioCategories Concert, iKONICs, Japan, Live, MusicTags A-Nation, Concert, Festival, Japan, Konbats, Konfire, Live, Music, performance, TrendLeave a comment on Konbats Shine Bright in the Daylight as iKON Rocks A-Nation! Donghyuk proves the name DK stands for Dancing King! Donghyuk, iKON’s sweet vocalist, known as THE angel amongst iKONICs, reminds us all that he’s not just that, but he’s also a Dancing King. In today’s performance at Move to Music, iKON not only brought the heat on stage, but Donghyuk specifically caused iKONICs to bring their fans out from all that *ahem* hot dancing he unleashed on all of them. Donghyuk’s charismatic, smooth, and strong dancing as well as his growl at the end of his part in Rhythm Ta has got all iKONICs in a frenzy. Beware of this guy, a dancing machine is behind all the sweetness and adorableness we are accustomed to seeing of him on a day to day basis. Be sure to tune in to tonight’s V-Night with Dong on V Live at 11PM KST! Posted on August 20, 2017 August 22, 2017 Author JayCategories LiveTags dance, Donghyuk, Live, performanceLeave a comment on Donghyuk proves the name DK stands for Dancing King! On 19th of August 2017, iKON performed on MOVE TO MUSIC concert showing once again that they can turn any venue into an iKONCERT. Besides iKON, MOVE TO MUSIC line up included B.I.G, WINNER and TOPP DOGG. iKONICs showed up in force and bathed the venue in their KONBAT flame. iKON opened with Sinosijak that was followed by a hilarious Ment, than came Rhythm Ta and My Type followed by a longer Q&A session which included the boys cleaning the stage floor (do not question it, it is iKON). Their part of the concert was concluded with high energy performances of Bling Bling and B Day. As always iKON was relaxed and at home on the stage performing live. Their stage experience is more than evident in their charismatic performances. Any iKON performance is a a true treat for fans and non-fans alike. They always make us proud. Now enjoy the performance thanks to kind iKONIC (@ikon_bp) sharing it. iKON recently cameback with a new mini album in Japan titled, New Kids: Begin on August 16, 2017. This is the Japanese edition of their single album that came out in Korea in May 22 with additional two new Japan exclusive songs, Perfect and World Wide. Not only do the Japanese get two brand new, heartbreaking beautiful and party anthem IMO, songs, but the promotion YGEX, YGE’s Japan division, has rolled out for iKON is a pleasant as well as welcome shock for iKONICs who have been waiting for iKON’s Japan comeback, and new songs, for a few months now. iKON’s name and the images of the members were emblazoned along mighty LED sided trucks while the Japanese versions of the New Kids MVs were continuously played on giant LED screens high above the city’s bustling centre from towering department stores. On release day, music stores seemed to compete with tagging YGEX on social media with their iKON display, as if each was trying to outdo the other with how big their displays were as well as the amount of posters plastered around their stores. As if all this wasn’t exciting enough, Japanese TV show Nico Nico sent MC Furuya Masayuki with a crew all the way to South Korea for a live coverage with iKON for the New Kids: Begin Japan official release! iKONICs were finally able to hear Perfect and Worldwide, which have been teased some weeks before. The new songs did not disappoint! Worldwide is a compulsive head bopper with a lively, retro hip hop beat that fits very well in the J-pop industry, while Perfect is a soulful R&B ballad which truly showcased iKON’s beautiful vocals and just how much of a force to reckon with iKON’s vocal line has become. The CDs have literally been flying off the shelves as quickly as they are stocked and iKON has already climbed to number 1 on Tower Music charts. 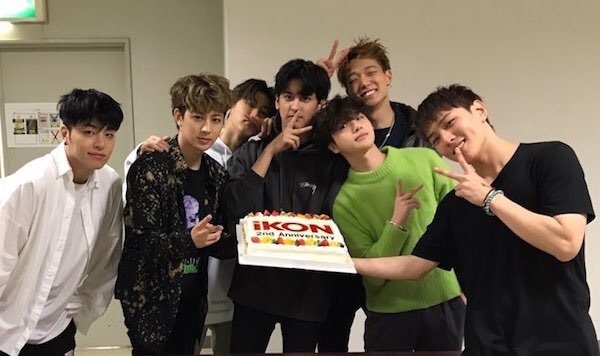 Fans have felt truly gratified to see Japan welcome iKON back so warmly.